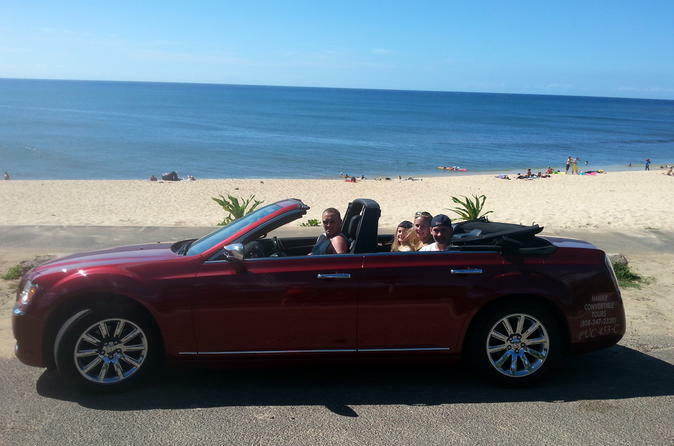 Enjoy a 6-hour customized tour to the North Shore of Oahu in a luxury 4 door Chrysler 300C convertible with plenty of leg room for all. This tour is flexible and customized for up to four passengers plus driver according to your schedule and interests. If desired, time allotted for swimming. Boogie boards and snorkel gear provided. You will be able to see all the famous North shore beaches. May see turtles on the beach. North Shore tour covers all the famous north shore beaches: Ali’i Beach (Turtles), Laniakea (Turtle Beach), Waimea Bay, Shark's Cove, Banzai Pipeline and Sunset Beach. Tour may include Disney Aulani, Green's Coffee Farm, Dole Plantation, Haleiwa Town, Waimea Falls, Pupukea Heiau, Ted's Bakery, Turtle Bay Resort, Laie Point and more. South East corner sites along the route may include: Leonard’s Bakery, Diamond Head, Kahala Resort, Waialae Country Club, Dog Bounty Hunter home, China Walls, Spitting Cave, Hanauma Bay, Lanai Lookout, Halona Blowhole, (Here to Eternity Beach) Makapu'u Point, Waimanalo Beach, Kailua Beach, Lanikai Beach, Pali Lookout, Old Pali Road, Queen Emma Summer Palace, Honolulu Country Club, Kapena Falls, Iolani Palace, and more. Jump off the rock at Waimea Bay or hit the waves at Pipeline. Snorkel with large green sea turtles at Ali'i or Laniakea beach. Snorkel gear and boogie boards are provided. Or just relax and enjoy the beauty of God's creation while watching surfers, sun bathers and hearing the mesmerizing sound of waves crashing on the shore. You may want to spend time browsing the unique shops, cooling down with shave ice or sampling macadamia nuts at the historical town of Hale'Iwa. A trip to the north shore wouldn't be complete without sampling Ted's Bakery famous chocolate haupia (coconut) cream pie, the popular garlic shrimp trucks, Dole Plantation's pineapple ice cream and Green World coffee plantation! To start the day off we can stop at Leonard's Bakery for their popular Malasadas Portugese donut and as we return from the north shore we can stop at the Waikele Outlet Mall at no extra cost as I live by there and just go home while you shop. The day is for you so stops are customized to your interest and schedule. Book soon as dates fill up and you don't want to miss this exceptional opportunity to visit Oahu's north shore, the home of the world champion surfer, John John Florence.